This pages focuses on the health benefits of elderberry - What is elderberry (Sambucus nigra)? What are some main elderberry benefits? Are there any side effects of elderberry herb? Read on and find out. There are various species of elder, but the one species of elder that is most commonly being used for medicinal purposes is the European elder (Sambucus nigra), also known as black elder. European elder is native to Europe, Africa, and parts of Asia, but it can now be found also in North America. It is a shrub or small tree that can grow about 10 to 30 feet tall (3 to 10 meters). The leaves of elder grow in opposite pairs and have five to seven finely serrated, drak green leaflets. The flowers are white to yellow. 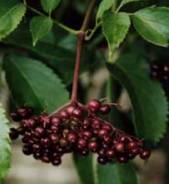 The berries are green, turning red-brown and then shiny black when ripe. Elderberry has anti-inflammatory, antiviral and possibly anticancer properties. It has long been used topically to treat wounds and infection by Native Americans. When taken orally, elderberry is effective for respiratory illnesses. In many countries (e.g. Germany), elder flower is used to treat colds and flu. It has been found that some chemicals in elder flowers and berries may help reduce swelling in mucous membranes (such as the sinuses) and can decrease nasal congestion. Since elderberry also contains flavonoids which have antioxidant properties, elderberry is said to be able to help prevent damage to the body's cells and can boost the body's immune system. Possibly then, elderberry can help prevent cancer. In addition, elderberry contains four anthocyanins that work to protect endothelial cells, which line artery walls, from oxidative damage caused by free radicals. Therefore, elderberry also has anti-aging properties. Colds and Flu: Elderberry is most commonly used to reduce cold and flu symptoms such as nasal congestion, sore throat, fever, and muscle pain. One study suggested that using a standardized elderberry extract, Sambucol, could shorten the duration of flu by about 3 days. Constipation: Elderberry is commonly used in Europe as a mild laxative for people suffering from constipation. Skin Infections: Elderberry is an effective detoxifier and, used topically, can help clear skin infections such as acne, boils, and skin rashes. Elderberry is available in different forms, such as syrup, tincture, capsules, and lozenges. The standardized elderberry extract, Sambucol, contains 38% elderberry extract for adults and 19% for children. For colds and flu, you can take up to 4 tablesppons of Sambucol a day. You may also want to take Sambucol with a tincture of echinacea for added immune system support. You can also make elderberry tea by boiling 3 to 5 grams of the dried elder flowers in 250 ml (1 cup) boiling water for ten to fifteen minutes. You may drink this tea 3 times per day. The fresh elderberry plant contains a chemical related to cyanide, which is poisonous. Therefore, do not use uncooked or unripe elderberries. When used properly for short periods of time (up to 5 days), there are no known side effects or reactions to the elderberry plant. However, as a precaution, pregnant and breast-feeding women should not take elder.